The details of last week's budget deal that averted the government shutdown are now starting to become clearer. I intend to present the facts of the specific cuts, and I believe that any objective analysis would have to conclude that President Obama and Democrats ultimately prevailed, even though some cuts will not be ideal. But in a divided government with a large conservative majority in the House that was intent on breaking the back of public investment in America, the end result can only be honestly described as an overall success for President Obama and Democratic priorities. So without further ado, let's look at the cuts. That in mind, now let's look at some specifics. I will not pretend that some of the reductions are not significant and won't cause a significant amount of pain. Let's be honest about that. Here's a description of the reduction plan, posted on the House Appropriations committee website. The CR also includes $6.75 billion for the Special Supplemental Feeding Program for Women, Infants and Children (WIC), which allows the program to support more than 9 million income eligible mothers, infants, and children up to 5 years of age. There is also a shortsighted $600 million in cuts from community health centers. This is perhaps one of the most damaging of the cuts. But it should be noted that this does not take money out of health reform's $11 billion in additional appropriations for community health centers, and federal funding of community health centers, before the cuts, were above $2 billion a year. It's a significant reduction, but we continue funding CHCs through both annual appropriations as well as health care reform. The CR provides funding above fiscal year 2010 levels for National Institute of Standards and Technology research and manufacturing programs, as well as critical FBI national security and prisons/detention requirements. the spending bill cuts money for the program that finances many family-planning services provided by Planned Parenthood and other organizations, Title X of the Public Health Service Act. The appropriation would be reduced to $300 million, from $317 million, Congressional aides said. The bill funds the Army Corps of Engineers at the President’s request level of $4.9 billion, supports existing applications for renewable energy loan guarantees at the Department of Energy, and provides a $697 million (7%) increase for the National Nuclear Security Administration to ensure adequate funding for critical components of our national defense. We protected funding for critical programs that invest in science programs, our kids’ education, and critical health programs. We are maintaining current levels of Head Start enrollment, funding Race to the Top, including an early learning element, and have sufficient savings available to maintain the Pell Grant maximum award and the broad education reform agenda, including K-12 education. There is still robust investment to efficiently and effectively run Medicare and to implement the Affordable Care Act. Even though we will no longer double the funding of key research and development agencies, you will still see strong investments in National Institute of Standards and Technology, National Science Foundation and the Office of Science. We avoided deep cuts in international programs that, among other things, threaten our transition out of Iraq. We were able to avoid making than $500 million cut in lifesaving biomedical research at National Institutes of Health. Republicans also failed in their effort to destroy Wall Street reform and to defund the consumer protection bureau. The deal protects funding to implement the most significant financial regulatory reform since the Great Depression as well as the nation's first federal agency with primary responsibility for consumer protection. In fact, under the deal, the funding for both the Securities and Exchange Commission and the Commodities Futures Trading Commission go up. As I pointed out before, even before the above late emerging details, we knew that we had protected issues at the core of progressive and Democratic principles: funding for women's health and family planning through Planned Parenthood (this is as big a symbolic loss for the conservatives as it is a substantive victory for us), implementing health care reform, and protecting the EPA's ability to regulate greenhouse gases. You will hear two things about the defense budget: that the President and the Pentagon were able to identify and cut $18 billion in unneeded defense spending, and that defense got a $5 billion increase over 2010. The $5 billion number is basically based on this: the Defense department, thanks to the diligence of Secretary Gates and President Obama, did not spend the full amount Congress appropriated to it. Aside from Overseas Contingency Operations, the DoD spent $508 billion in FY 2010, although Congress had enacted $531 billion. Subsequent actions of Congress reallocated the unused funds. The deal appropriates $513 billion for FY 2011, which is, in fact, $18 billion less than the amount enacted in 2010 but $5 billion more than the amount spent. So Congressional appropriation to Congressional appropriation year over year (i.e. 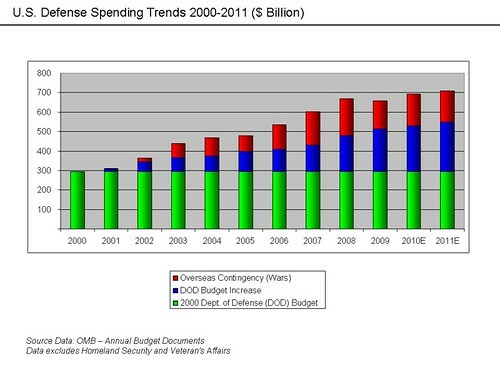 apples to apples) yes, defense spending is being cut by $18 billion. Hopefully, that clears things up. President Obama has not only taken steps to trim defense spending, including a $78 billion reduction in defense contracting over 5 years in 2010, by keeping his promise to withdraw troops from Iraq, he is ensuring that we can wind down a significant portion of our overseas expenses. The problem in the Defense budget is not the so-called "increase" in the availability of money by $5 billion from last year's spending levels. The problem is that Congress, in its infinite stupidity, continues to bar funds to transfer Guantanamo detainees to US soil, or even construction or modification of facilities in the US to house detainees from Gitmo. That is as stupid as it is an affront to American values. But the next time someone screams at you about Obama not having closed Guantanamo and proceeding with military trials of the detainees, ask them what they were doing while Congress, almost unanimously, pulled the purse-strings in a way that made the closure of the facility impossible. So there you have it. The president and Democrats have had to make some pretty painful cuts in order to keep the government from shutting down. But they also preserved important programs that reflect our values. Even where they have had to swallow cuts, they have managed to protect the most critical areas of service. Cuts are never easy, especially when it's affecting you. I have no illusion that we would be better off without many of these cuts. But we have a democracy. And we have divided government. The President cannot spend money by dictate. Hence, compromise. This is a compromise, a real one. We had to give some, and we won some. But these details tell you on whose side Barack Obama is fighting, and by contrast, to what future the Republican party would like to lead us.